Saint Francis wrote the beautiful ‘Canticle of Brother Sun’ towards the end of his life. It took a lifetime for Francis, a great Saint, to come to fully realise the intimate connectedness of all creation. We, as children of the God who created all we see and know, are called to care for this creation. To be good stewards who promote well-being for all of God’s creatures. In a throw-away global culture driven by excess and the need to consume, this message holds particular significance and value. 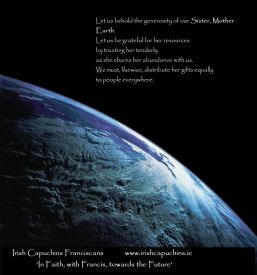 It is a call to live in balance and harmony, a call to live with awareness and sensitivity, a call to speak out in favour of the protection of God’s creation. We are called to live in such a way that we facilitate, promote and support the on-going creativity of the Trinity in our world and in each other.